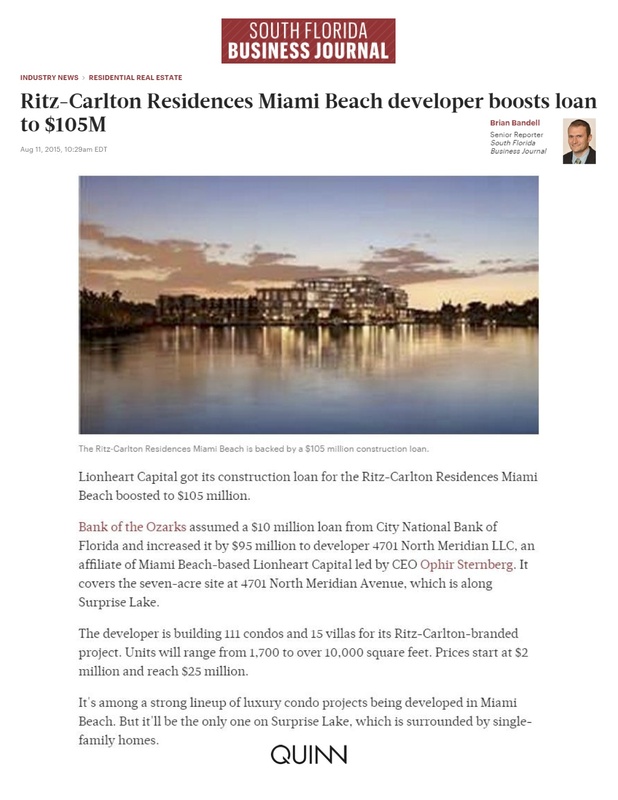 Lionheart Capital got its construction loan for the Ritz-Carlton Residences Miami Beach boosted to $105 million. Bank of the Ozarks assumed a $10 million loan from City National Bank of Florida and increased it by $95 million to developer 4701 North Meridian LLC, an affiliate of Miami Beach-based Lionheart Capital led by CEO Ophir Sternberg. It covers the seven-acre site at 4701 North Meridian Avenue, which is along Surprise Lake. The developer is building 111 condos and 15 villas for its Ritz-Carlton-branded project. Units will range from 1,700 to over 10,000 square feet. Prices start at $2 million and reach $25 million. It’s among a strong lineup of luxury condo projects being developed in Miami Beach. But it’ll be the only one on Surprise Lake, which is surrounded by single-family homes.